The Looney Tunes Show is the most off-putting version of Looney Tunes I’ve ever seen. Instead of a universe where anything could happen, here the plots are standard sitcom tropes. Instead of a universe spanning eons and continents and galaxies, here all the characters live on the same cul-de-sac. Instead of a universe run on the primal conflict between two individuals, here all the characters hang out together. Which could have its advantages, if these were indeed the Looney Tunes characters. But, at the risk of going Studio 60, they’ve all been lobotomized. Yosemite Sam has one scene: turning down Bugs’ invitation to his fifth dinner party this week because the buttery snacks are too fattening. Is this Stepford? To make matters worse, Lynchian pauses inflate 10 minutes of story into 20 minutes of almost recognizable behavior, killing jokes in the process. It’s like when Louie had that segment casting the show as a conventional multicam. I don’t know who this show is aimed at, but I know they’re young and they deserve better. 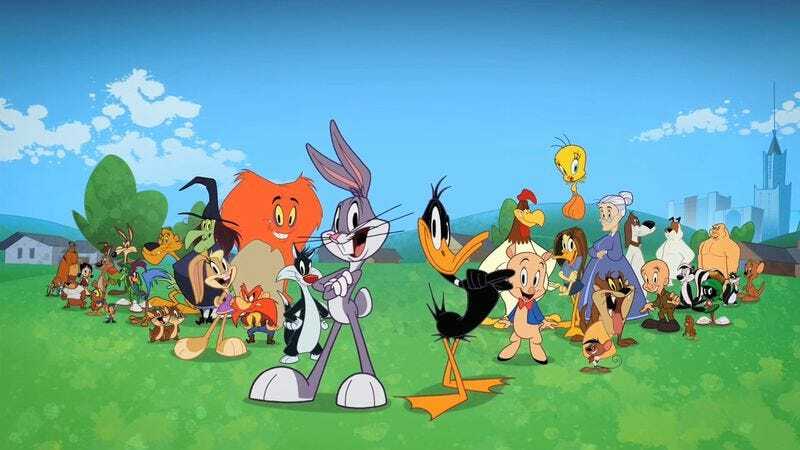 A running Looney Tunes lampoon of the sitcom has extraordinary potential, but the season première “Bobcats On Three!” just lies there, occasionally tossing off some wordplay. The very first gag of the season is a bit where Bugs silently judges Daffy as the duck watches an exercise tape from a comfy chair, which really starts the year off with an “um.” Almost all of the comedy is in dialogue, too. There’s one visual parody, no radical line readings, and no real sight gags unless you count Bugs’ distended stomach. The biggest advantage to this show is having all the characters in the same room—as long as it’s a classic sitcom, at least we get to see Marvin each week—but only a handful of characters are actually used in “Bobcats On Three!” and mostly just for a scene or two. It’s clear the sitcom format is just convenient. The Looney Tunes Show exists happily inside the lines. Daffy Duck, a character traditionally defined by mania, is so sedate he can’t even land one of the decent jokes: “Coach, that’s a title I’ve never had. Or even lied about having.” Yes, that’s the A-plot: Daffy coaching some neighborhood kids (and Gossamer) in water polo. The B-plot is about Bugs getting fat off of Porky’s pastries. The kids lose until Gossamer becomes goalie, but that feels like cheating, and Gossamer decides to lose with dignity instead. Daffy can’t swim, and Bugs rescues him—in another good gag, a slo-mo, shut-dut-dut take on Chariots Of Fire crossed with Baywatch—by belly-flopping the water out of the pool. The end. What a waste. The show could air three shorts in the same amount of time. It’s pretty condescending how often plots hinge on characters being stupid. Even for sitcom characters—even for a children’s show, even for extra-dumb kids—it’s ridiculous that Daffy doesn’t realize Gossamer’s size is an advantage. Or that Bugs doesn’t remember a party guest’s name. It’s bad enough that suave Bugs Bunny has no edge whatsoever, but being unable to pull off the simplest of deceptions is just lazy. But okay, so it’s a huggable take on Looney Tunes for toddlers that sticks almost entirely to dialogue. With that extremely low bar, there are some chuckles to be had, particularly with Daffy’s running gag of forgetting his players’ names. “Emily? I’m never gonna remember that. What about you?” he asks a boy. “Andrew.” “Yeah, these names are impossible. You know what, I’m just gonna call everyone Jennifer.” As the episode goes on, Daffy gets some of his edge back, which is all the more effective after a whole act of rainbows and butterflies. He tells his team, “A lot of today’s loss is on me. But most of it’s on Glasses.” After their final noble defeat, he sees the silver lining: “No one cares about water polo!” Add Bugs’ big scene and Porky’s “Y-y-you’re the big deal” zinger, and the three main characters each get a laugh. Most of the backgrounds are functional, and they look like a basic computer program for kids to paint and solve puzzles and play games on. But there are traces of graphic design that actually reach out to Chuck Jones, like a brick wall partially covered in solid green with a leafy border design and a shadow twin on top of it. The animation suggests the bush more than it describes it. And the characters are slightly more human-looking now that everyone has settled down in a nice neighborhood. At the same time, they look extra flexible, like they have one too many points of articulation, not that they do anything with that freedom. Daffy does have a nice moment of contortion when Taz bites him, though. But the best part of “Bobcats On Three!” is the Merrie Melodies short near the end. I won’t say it’s worth the price of admission, but Marvin sings an ode to his laser, so you be the judge. Before a single character walks on-screen, the image of Marvin’s spaceship is more interesting than anything that’s come before it, a circular, brushed gold hallway outlined in glowing lights. Two circular windows reveal a deep blue field with stars, three planets, and a light, wavy band of gas, all classically complementing the golden interior. What follows is just as beautiful, evocative, and expressionistic, and it’s all in the service of a love song to a comically enormous gun, complete with the cheesy, disembodied heads of Marvin and K-9 going full music video in space. And then comes the punchline: The laser just wasn’t plugged in. If only all the stupidity on The Looney Tunes Show had such inspired results.